From 1980-2002, over 62 million people visited Yellowstone National Park (YNP). During the same period, 32 people were injured by bears. The chance of being injured by a bear while in the park is approximately 1 in 1.9 million. Grizzly bear-inflicted injuries to humans in developed areas averaged approximately 1 per year during the 1930’s through the 1950’s and 4 per year during the 1960’s. Grizzly bear-caused human injuries in developed areas then decreased to 1 injury every 2 years (0.5/year) during the 1970’s. In the last 20 years (1980-2002), there have been only 2 grizzly bear-caused human injuries in a developed area. Human injuries from grizzly bears in the backcountry, a rare occurrence before 1970, increased to an average of approximately 1 per year during the 1970’s, 1980’s, and 1990’s. The slight increase in backcountry injuries from the 1970’s through the 1990’s may be related to the increase in backcountry recreational use since the early 1970’s. Human injuries from black bears have decreased from averages of 46 per year from 1931-1969, to 4 per year during the 1970’s and less than one (0.17) per year from 1980-2002. Undoubtedly, some minor injuries were not reported by park visitors. Only 7 of the 45 injuries caused by black bears from 1970-2002 were in backcountry areas, and 2 of these were from females “defending cubs.” Thirty-four injuries were from black bears along roadsides as a result of visitors getting too close while attempting to feed, take pictures, or get a better view of bears. Three injuries were from black bears in developed areas, and 1 injury was during a bear-relocation accident. Five known bear-caused human fatalities and 1 possible fatality have occurred within YNP. In addition, 1 fatality occurred in the Gallatin National Forest outside of the park. In October of 1986, the fifth fatality in YNP occurred when a photographer approached an adult female grizzly bear too closely in Hayden Valley. The fourth fatality occurred in July 1984, when a grizzly bear killed a backpacker in a backcountry campsite located on the southern end of White Lake. The third fatality occurred in June 1972, when a man returned at night to an illegally established camp and approached to within 50 feet of a grizzly bear that was feeding on food that was left out. The second fatality occurred in August 1942, in the Old Faithful campground. The species of bear involved could not be determined. The first fatality occurred in 1916 when a grizzly bear killed a man in a roadside camp. A possible fatality supposedly occurred in 1907 when a man was attacked by a female grizzly bear after he prodded her cub with an umbrella. However, the validity of this incident is questionable. 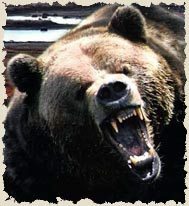 In late June 1983, a fatality occurred in the Gallatin National Forest outside the park when an adult male grizzly bear attacked a camper in the Rainbow Point Campground. day use records are not collected.